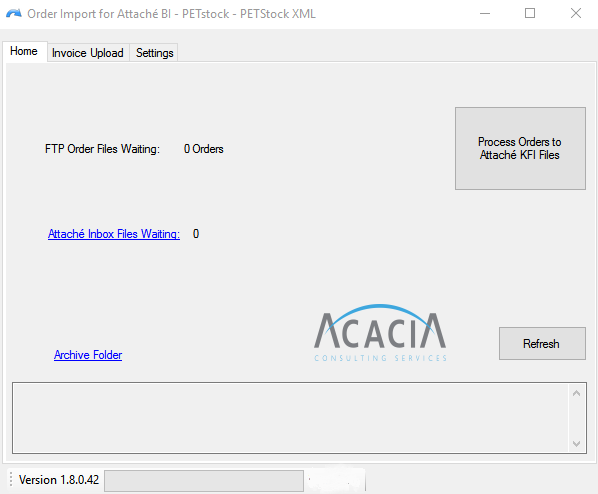 Acacia recently released an XML EDI Utility for Attache BI specifically to suit the requirements of PETstock EDI. The EDI Utility is used to retrieve XML Orders and convert them to Unattended KFI files for Sales Orders suitable for Attache BI. The XML Orders from the customer may be downloaded from an external FTP or SFTP folder, or they may be loaded from a local folder in cases where they have been delivered via email. 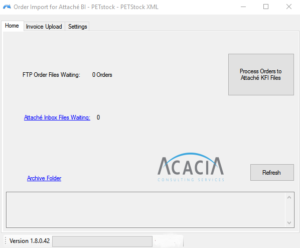 Once downloaded, they are automatically converted to unattended KFI files suitable for importing using Attache BI’s ADI Sales Orders screen. We use Attache’s XML formatted unattended KFI files for greatest reliability and flexibility. The EDI Utility is also used to upload customer Invoices back to the Customer once they’ve been prepared. They may be uploaded to a folder in an external SFTP or FTP server. Contact us if you need to add XML EDI capability with your Attache system.